In 1838, a French craftsman named Jean Bardou came up with the idea for a booklet of rolling papers made of thin, pure rice paper. The booklets were a success and Bardou's trademark, the initials "JB" separated by a diamond, became such a common sight that people began referring to them as Job, thus the brand-name was born. Joker Rolling Papers come in various sizes, 1.0 to 1.50 and for a lighter taste, the French Lights are a great choice. 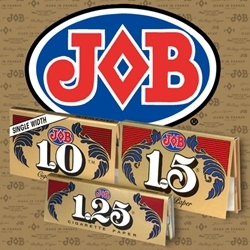 Job papers are easy rolling, pure-gummed and smooth burning. A perfect complement to use with any premium brand on the market today. Each of these papers are a product of high technology and the quality tradition of all French-made JOB rolling papers. Smoking enthusiasts appreciate a quality brand like JOB rolling papers. At Smokers Discounts we believe you will too! We’ve made it easy and affordable to buy tobacco products online. Call us for more details!